As opposition to the Common Core academic standards continues to intensify, the state of New York is now considering a possible delay of the new standards. In Albany, New York, Assembly Speaker Sheldon Silver (D) said Tuesday he expects the state Board of Regents to develop a plan to improve and even delay implementation of the Common Core standards. As Capital New York reports, Silver said he intends to first consider what “remedial actions” the Regents devise prior to intervention by the state assembly with legislation. According to Silver, Board of Regents Chancellor Merryl Tisch has organized a working group to first explore ways to improve implementation of the standards. The subcommittee is expected to report back to the Regents in February. The Regents signed on to the controversial standards in 2010. However, as Breitbart News reported last August, student test scores on the new Common Core-aligned assessments plummeted. The results found that in New York City alone, 26 percent of students in third through eighth grade passed the new English exam and only 30 percent passed the math test, compared to 47 percent and 60 percent, respectively, in the previous year. Teachers unions also complained that the Common Core-aligned tests were administered before teachers and schools had all the resources and curricula aligned to the new standards. 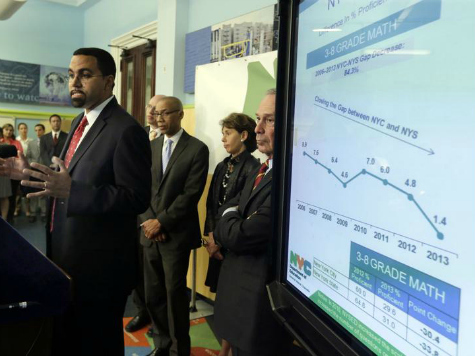 In October, the controversy in New York intensified as forums on the topic of the new standards grew more heated, with some parent groups calling for the resignation of state education commissioner, John King. Though Gov. Andrew Cuomo (D) originally endorsed rapid transition to the Common Core standards, he has distanced himself from them since the outrage against them has deepened. In early December, Cuomo hinted that he might attempt to engage the state legislature to slow down the implementation of the standards. Capital New York reports that Cuomo did not even mention the Common Core standards in his State of the State address Wednesday, much to the disapproval of teachers’ union leader Richard Iannuzzi, president of New York State United Teachers.